A Plymouth businesswoman has created a floral tribute which was placed to mark a one minute silence held to remember those lost to brain tumours. 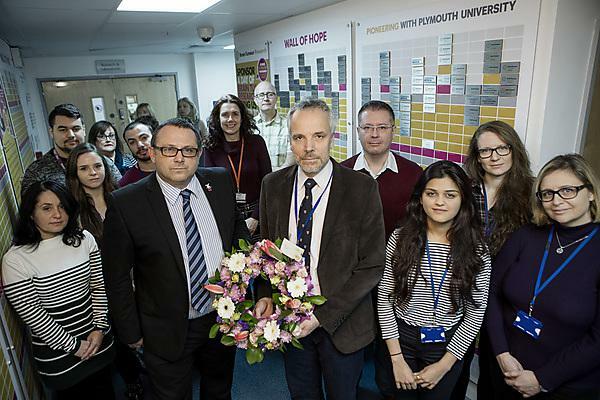 Wendy Jordan designed and produced a loosely gathered wreath of fresh flowers which was laid during a ceremony at Plymouth University Peninsula Schools of Medicine and Dentistry to mark the start of National Brain Tumour Awareness month on Wednesday 1 March. Wendy’s mum, Susan Flower, passed away 14 years ago just weeks after being diagnosed with an aggressive brain tumour. She was 54 and had lived in Plymouth all her life. The one minute silence was being observed by scientists and researchers from the Brain Tumour Research Centre of Excellence at Plymouth University Peninsula Schools of Medicine and Dentistry where Professor Oliver Hanemann and his team are focusing on low-grade tumours, which typically affect children and young adults. The work of Plymouth scientists focuses on identifying and understanding the mechanism that makes a cell become cancerous and exploring ways in which to halt or reverse that mechanism. They are finding new biomarkers and drug targets in human primary cell cultures and investigating how existing drugs could be re-purposed to make drug therapies available to patients safely and more quickly. The national charity Brain Tumour Research is highlighting the fact that brain tumours kill more children and adults under the age of 40 than any other cancer yet just 1 per cent of the national spend on cancer research has been allocated to this devastating disease. She has chosen to speak out during March, Brain Tumour Awareness Month, and is urging people to take part in the UK-wide fundraising event, Wear A Hat Day on Friday 31 March. Now in its eighth year, Wear A Hat Day is supported by Debbie McGee, who lost husband Paul Daniels to a brain tumour a year ago, celebrated milliner Stephen Jones OBE who cared for a terminally ill friend, actor and author Sheila Hancock CBE whose grandson was successfully treated, and singer, songwriter and record producer John Newman who is awaiting treatment for his second brain tumour. Brain Tumour Research is lobbying the government and larger cancer charities to see the national spend increased to £30–35 million a year, in line with other cancers such as breast and leukaemia. Wear A Hat Day will see schools, workplaces, families and individuals across the UK fundraising and taking part in all manner of hat-themed fundraising events to raise awareness of brain tumours and help fund life-saving research. Funds raised through 2017’s event will develop the charity’s network of world-class brain tumour research centres in the UK. March is Brain Tumour Awareness Month with various activities taking place across Plymouth University.